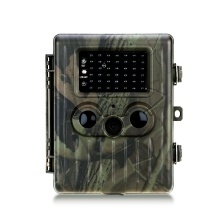 This trail and game camera comes with 42pcs low-glow IR LEDs and a highly sensitive PIR sensor. It can be triggered in a certain region of interested (ROI) by detecting any movement of objects or animals in an impressively fast speed of 0.7 seconds. It takes clear (up to 12MP) full-color image in the daytime, black and white image for nighttime, and 1080P video clips with sound. Its 100° wide detection angle and 9 pictures shot each time guarantee you&apos;ll never miss any unforgettable moments. This camera is not just widely used for outdoor scouting games and wildlife observation, but also popular in home and office security. High Resolution: 12 Megapixel full-color photos in daytime (black and white at night), and 1080P video with audio record. Adjustable resolutions are available for images and videos. Super Fast Trigger Speed: With 100-degree wide angle of PIR sensors, 0.7s impressive trigger speed, and up to 9 pictures multi-shot feature, you are guaranteed to never miss any detail of the action. Long Night Vision Range: 42pcs black infrared LEDs provide up to 65 feet night time vision, which makes this camera a stealthy unit that does not intrude into the natural habitat. 2.5" LCD Screen: Displays the data in the photo or video for convenient setting and viewing. 3 capture modes (Photo / Video / Photo + Video) allow you to select the proper mode for different observation. 2-Level Protection: IP54 Waterproof, protect your hunting camera from raining, moist, sand, dust, corrosion, etc. Lockable and password protection offers your trail camera another guarantee. More Functions: Intervals, Time stamp, Timer, Serial No., Time-Lapse, Multi-language. Great for hunting, wildlife observation, home security, surveillance and scouting game. Long Battery Life: This camera runs on a rechargeable lithium battery (included), which can reach up to 3 months long battery life. It is IP54 waterproof and and can be left outdoors for long periods.